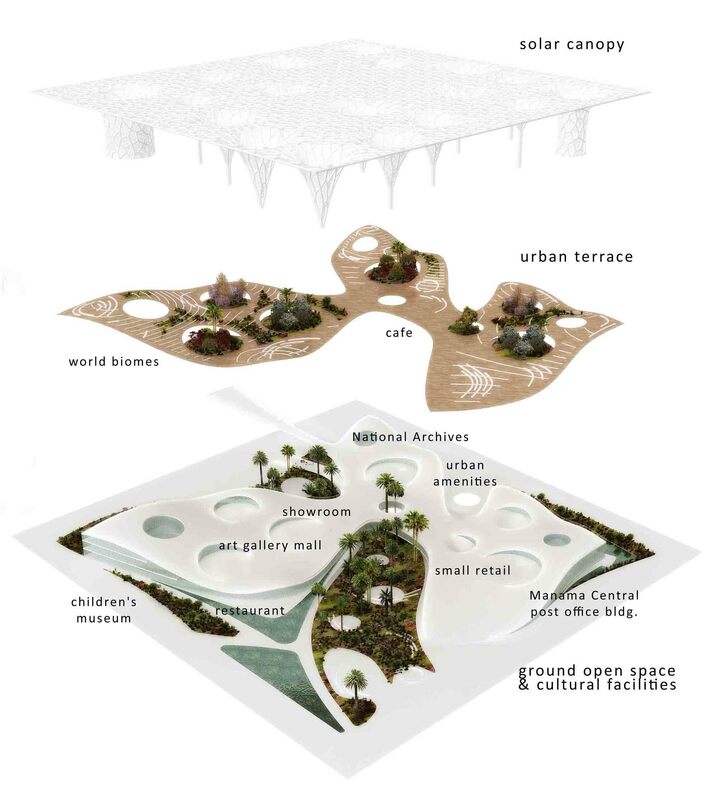 The proposal by Influx_Studio for the Bab Al Bahrain Urban Oasis explores the value of the cultural and natural landscape inheritance as a design opportunity to address climate issues in public space, while catalyzing the urban potential of the site in the emerging new city urbanity. 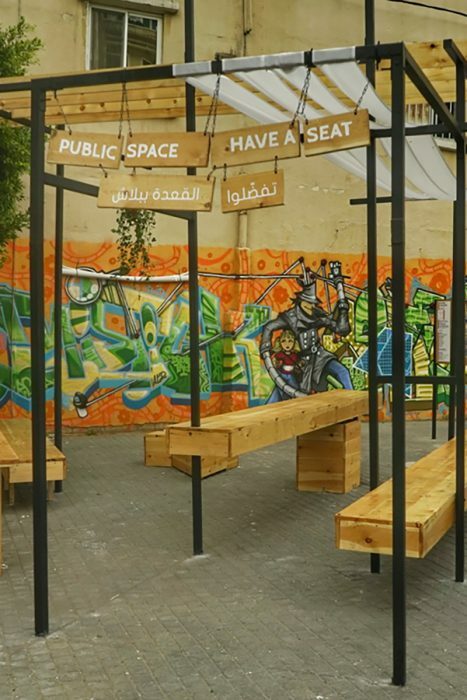 Urban Oasis is called to be the most important public space of Manama, embodying its dynamic character and showcasing its new sustainable identity. 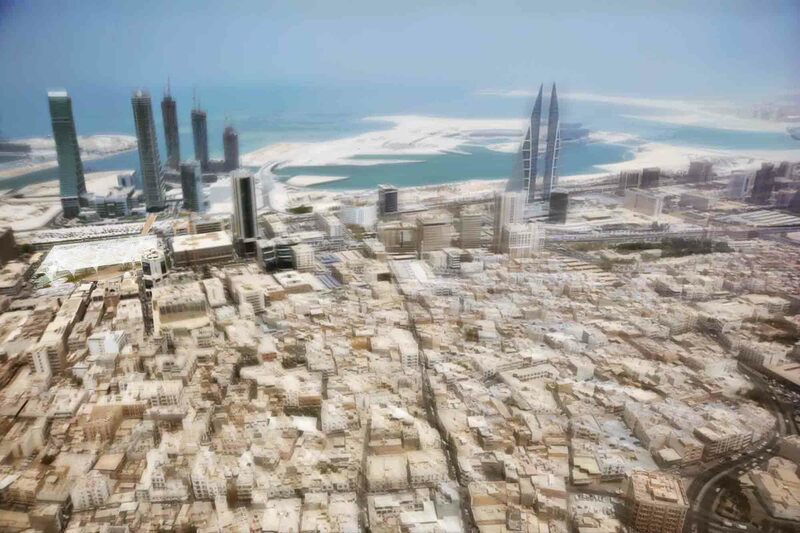 A quiet but profound urban makeover is taking place at Bahrain and especially at its capital, Manama. 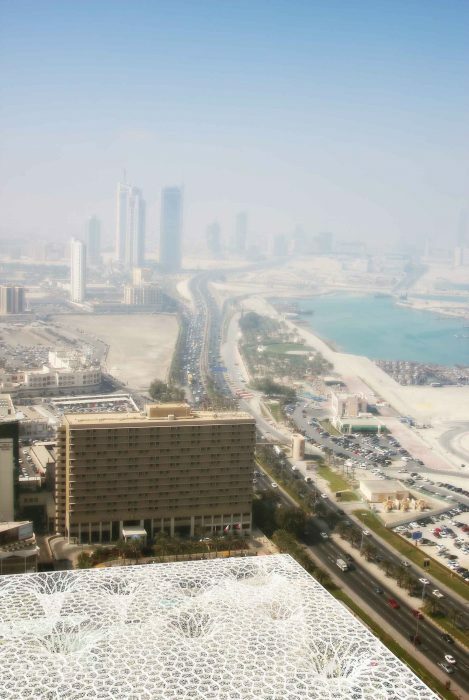 The city is evolving in the global economy and becoming the financial hub of the Middle East. A new urban shape is being unveiled witnessing a dramatic transformation of the urban fabric, opposing two different urban scales from the traditional historic city, through the new breathtaking waterfront skyline. Hybridizing urban space with landscape and ecology, the BAB Urban Oasis represents by its strategic position and historical importance, a great opportunity to create an exceptional and lively metropolitan interface, able to link and gather both, the historical tight-knit urban fabric and the new modern city front. 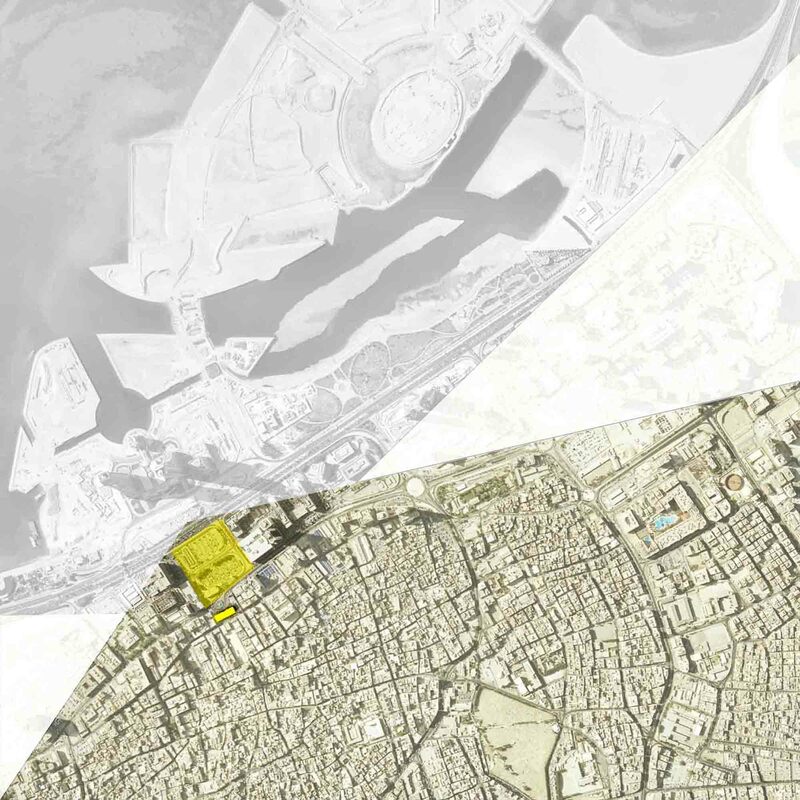 The key issue is how to allow this soft transition while integrating both, values from historic urban tradition and from modern dynamics, embodying local landscape character and defining a strong landmark image for this strategic gathering place of Manama. The current dependence on the car as primary means of transport furthers several difficulties. A ‘drive-in open space’ mentality has been developed. 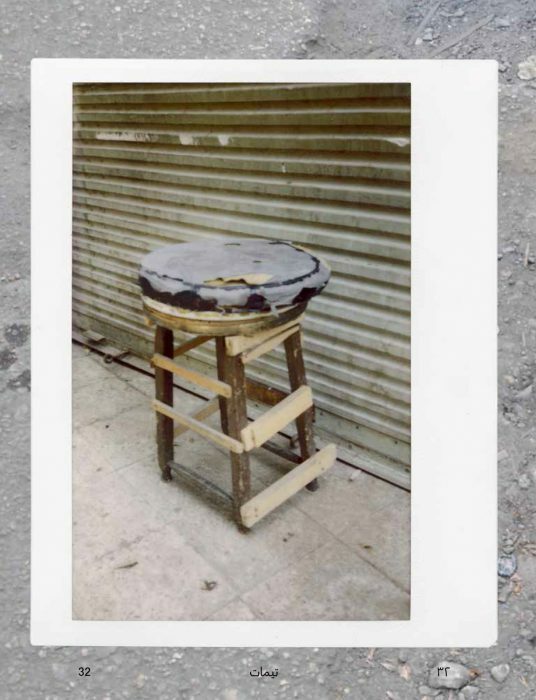 Therefore the main strategy to reinstate a strong sense of place is to transform the “passing through” condition of the square into a “stay in” condition. In the aim to provide a pleasant pedestrian environment, it must become a social hub with great attractiveness, with a maximum degree of social interaction and activity. This pedestrian new vocation of BAB Square is a key condition to ensure spatial relationships to connect and recognize the nearby neighborhood context. 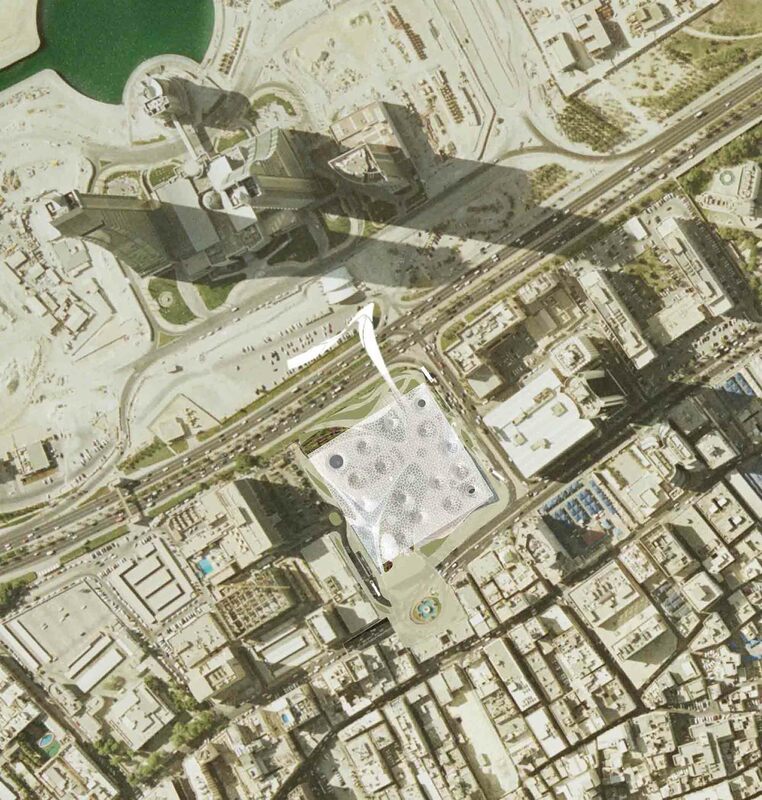 The urban strategy consists in moving down to the underground level the current circulation pathway in front of BAB, giving access by the way direct to the underground parking of the Square. This underground by-pass will allow relieving congestion in the traffic over the Historic gate, enhancing East- West urban connectivity, with a more fluid express way. This measure allows the redesigning of the existing runabout in order to facilitate pedestrian crossing and minimize the presence of cars within the square, sewing the cut created by the Government Avenue. Moreover, a new large unifying pavement surface will integrate a quiet urban drop-off zone for the new Square and the BAB building. 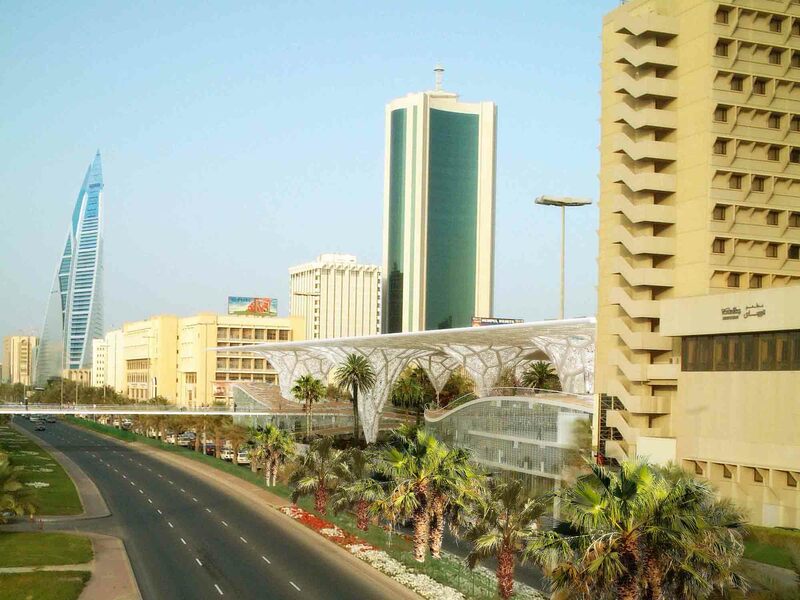 The access to the Suq by car under the archways of the Bab Al Bahrain will be still allowed enhancing the position of the building as a gateway to the City. 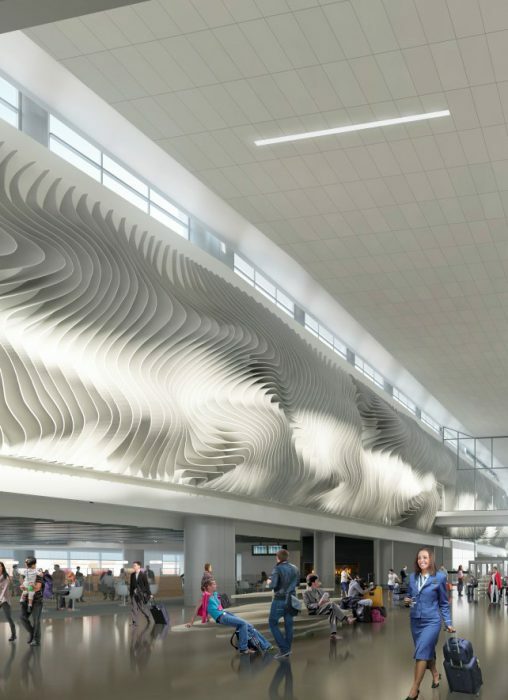 This new shared interface will encompasses new forms of accessibility and attracts people from all directions to have a great urban experience. 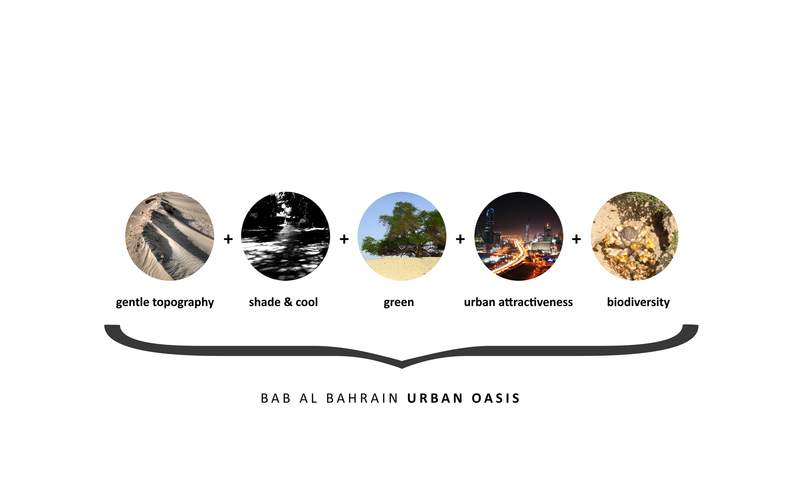 Envisioning a progressive attitude towards sustainability in the MENA region, the proposal introduces an integrated cultural and ecological vision for Bab Al Bahrain. 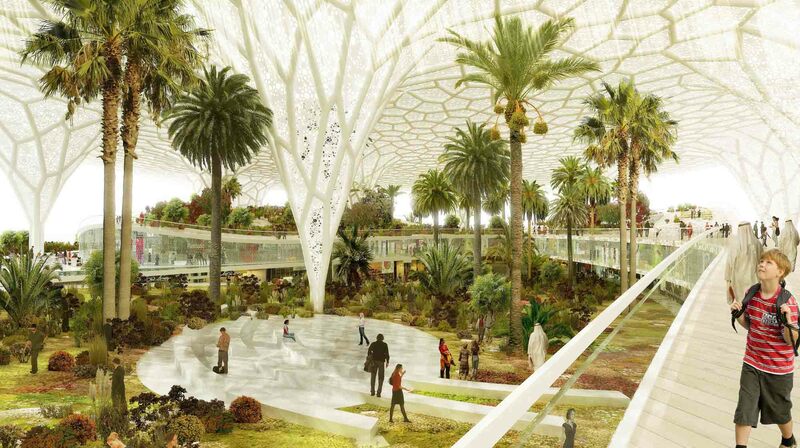 Very careful attention has been given to sustainable design principles, in terms to create a main bioclimatic passive strategy, which allow with simply good practices the emerging of a unique and world class public space. 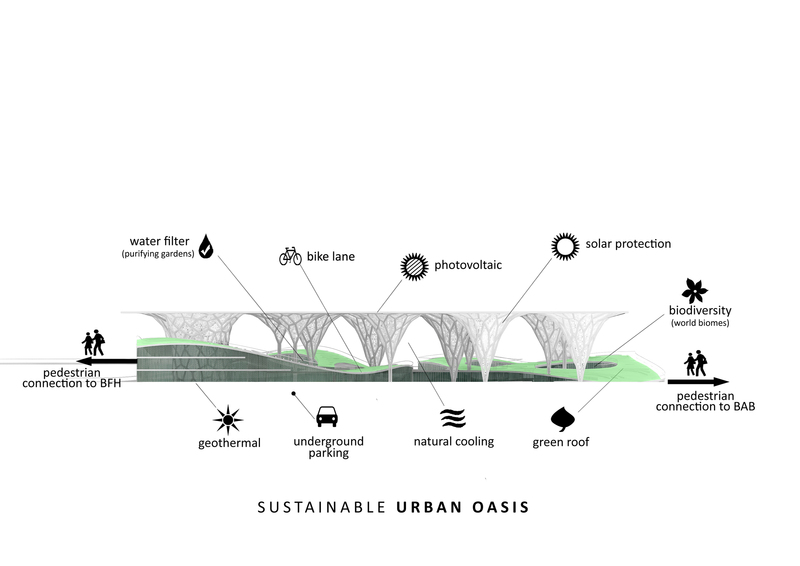 The BAB Urban Oasis proposal looks forward to activate the use of outdoor spaces throughout the day, using passive cooling devices to naturally cool and mitigate the hot daytime environment. 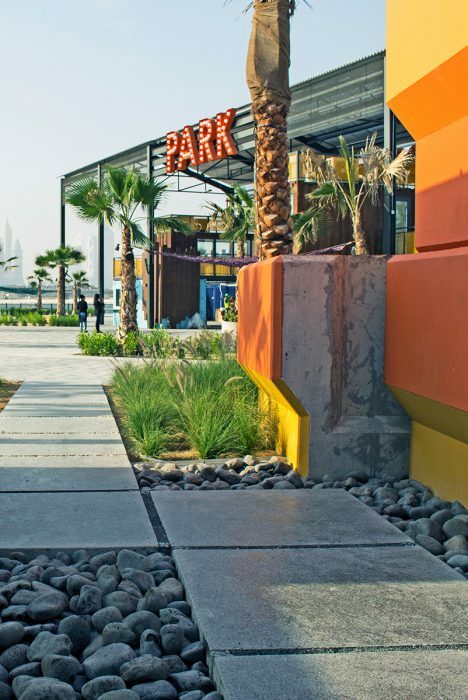 Threes, plantings, land modulations greening, innovative buildings and shade structures are all key figures to shape a more pleasant environment and to increase a wide range of outdoor activities. 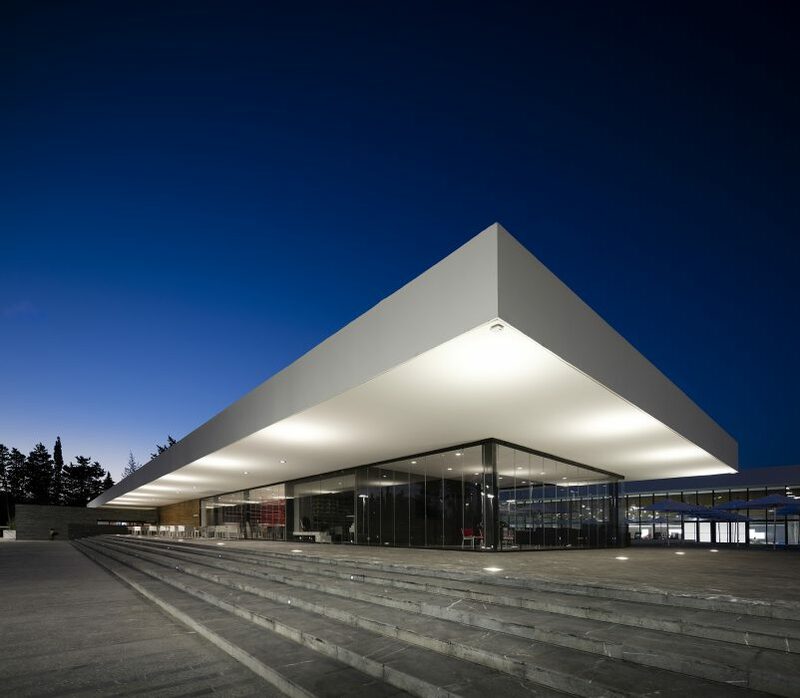 The project is composed of three main layers evolving in a symbiotic and sustainable way. 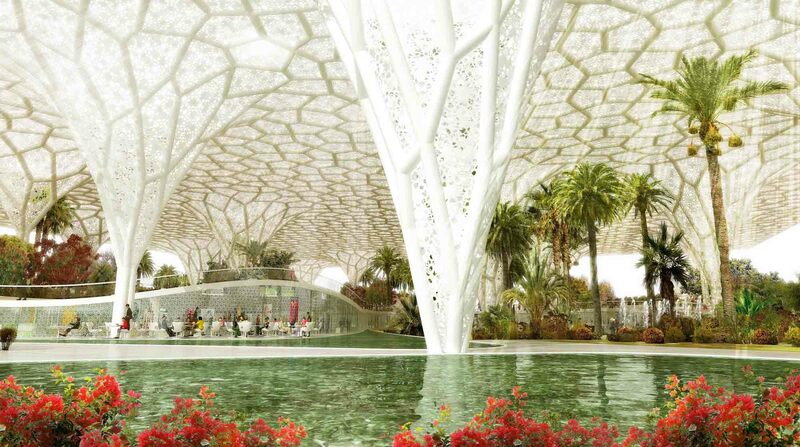 In response to the climate, a monumental urban canopy like a sun umbrella will provide shade, shelter, and comfort to the pedestrian areas placed below. Climate comfort ensures having a meeting place that offers a relaxed natural atmosphere, a real oasis away from the stress of urban conditions, experiencing well-being and nature in an organic artificial topography. Over the cultural programs and under the shade canopy, a large open space is defined by its artificial geography. It groups silent and shaded calm zones along its gardens patios and green slopes, rather than offering a traditional public space. 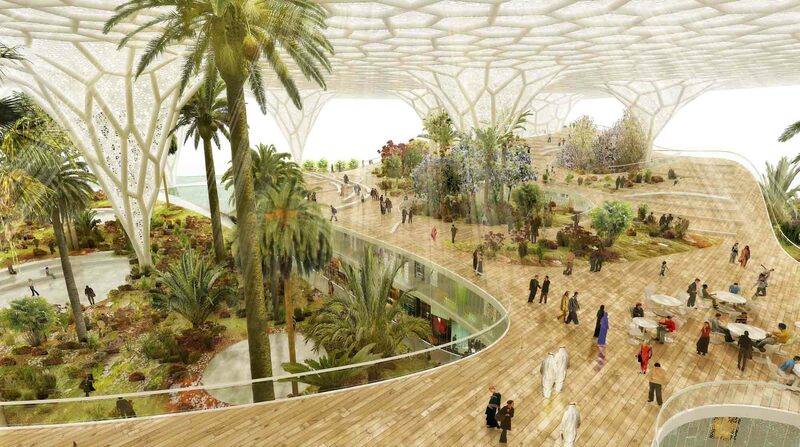 The public urban ground level, with its open spaces, water landscaping and main public pedestrian and car access, will host the principal cultural and urban facilities. 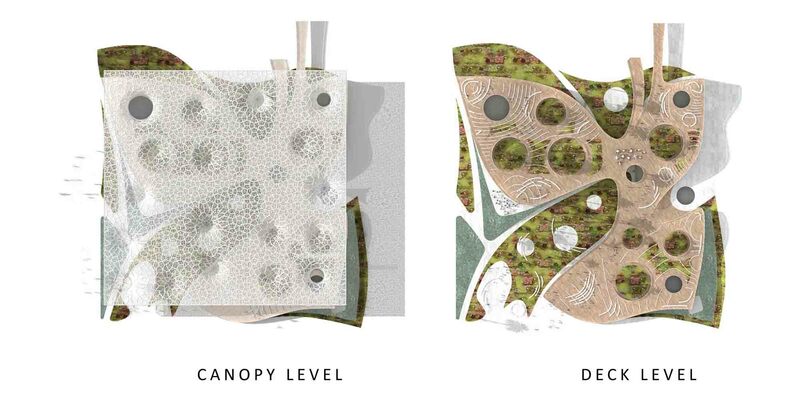 A gentle descending slope garden will draws people towards a central entrance accessing some programs and parking.